How much revenue are casinos making from their poker tables? Well here is one instance where poker seems to be a bigger money maker for a casino than Slot Machines! 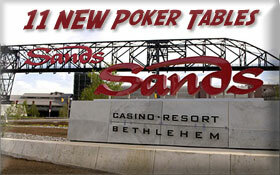 The Pennsylvania Gaming Control Board recently granted the Sands Casino in Bethlehem, Pennsylvania permission to add 11 table games to their floor bringing the total number up to the state maximum of 100. All of the tables the Sands plans to add will be poker tables. This will increase the number of poker tables at the Sands from 12 to 23. Sands President Robert DeSalvio cited players not able to get a spot at in a poker game as the impetus for adding more tables. To make room for the added tables the Sands will be reorganizing some of their slot machines. The Sands Casino has grown exponentially since the addition of table games, and is now the second largest casino in the state –with table game revenues reaching $4.8 million in September. The latest Poker News is that the casino will also be adding a hotel to the property next year which should further their current revenue stream. The popularity of table games, most notably poker, has been a boom for Pennsylvania casinos which until this year were limited to slot machines. This entry was posted on Saturday, October 30th, 2010 at 2:06 pm and is filed under Poker News. You can follow any responses to this entry through the RSS 2.0 feed. You can leave a response, or trackback from your own site.